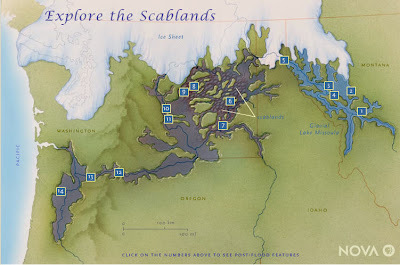 Last night we watched a NOVA special about the unique geomorphic region known as the ‘Channeled Scablands’ of the northwest United States called Mystery of the Megaflood. During the latest Pleistocene as the continental ice sheets began to retreat, huge lakes (similar in scale to some of the Great Lakes) that were dammed by ice broke free and rushed across the state of Washington creating erosional and depositional features that perplexed geologists and geomorphologists for a long time. If you don’t know about this story, check out the NOVA website (click on image or link above). They have tons of information to help you learn more about it. The program was pretty entertaining. As a geoscientist it’s always nice to see the science portrayed in these programs. Yes, they can be a little sensationalized with the scary music and overdramatized reenactments, but that’s kind of fun in a way. I recommend it. Check out this interactive on their website for a tour across the region highlighting the key features. One of my favorite features are the giant bedforms (ripple marks, essentially) that were formed near where the flood started near Missoula, Montana. 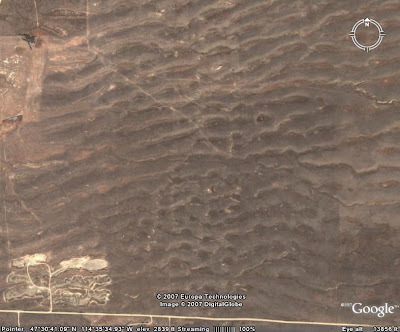 I went on GoogleEarth and started poking around the area and lo and behold you can see them fairly easy. They are on the order of 35 ft high and have wavelengths of hundreds of feet. 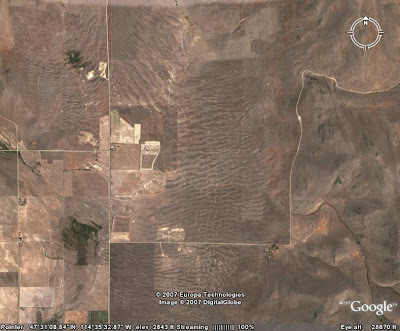 The image below shows an area about 5 miles across (copy/paste these coordinates into GoogleEarth to go there: 47.48N, 114.59W). And here’s a closer shot (this area about a mile across). These suckers are huge! Anyway…check out the website and rent the show. It also goes into the incredulity the early 20th century geologists had regarding this catastrophist point of view. That’s another interesting topic for another time. Another post forthcoming is — what happened when these floods reached the ocean? People have done some work on this and it is really interesting…stay tuned. ← Looking for a job in geology? Fascinating. You explain very well. But again a great post!